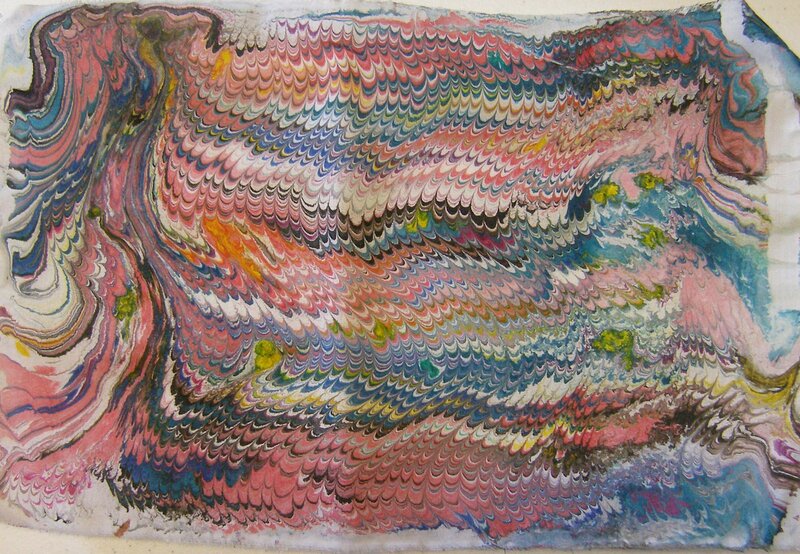 I stated at the time that I wanted to do more experiments and this was reinforced when I came across the work of Marit Fujiwara https://tigerctextiles.wordpress.com/2015/05/13/review-of-artists-marit-fujiwara/ who used marbled fabric as the basis for her creations. Some searches on the internet bought me to Galen Berry’s website http://marbleart.us/index.htm. 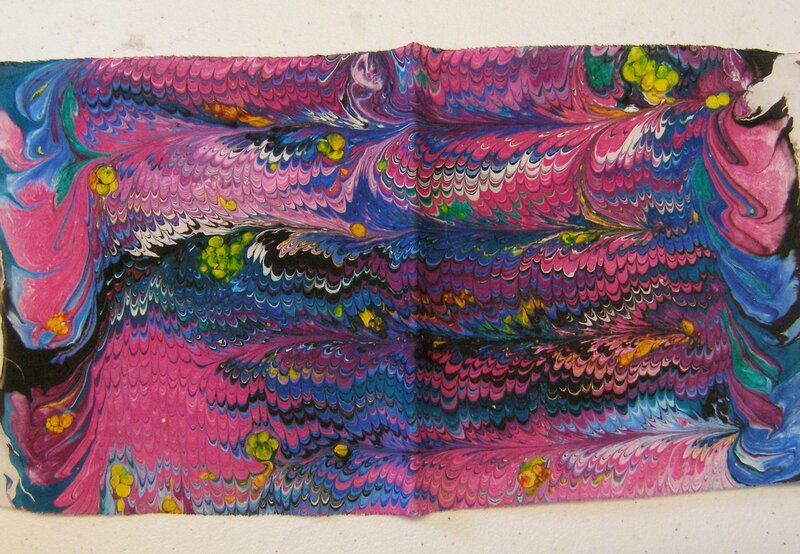 Galen has 30 years experience in marblng and has self-published an amazing booklet “The Art of Marbling” that I quickly purchased. 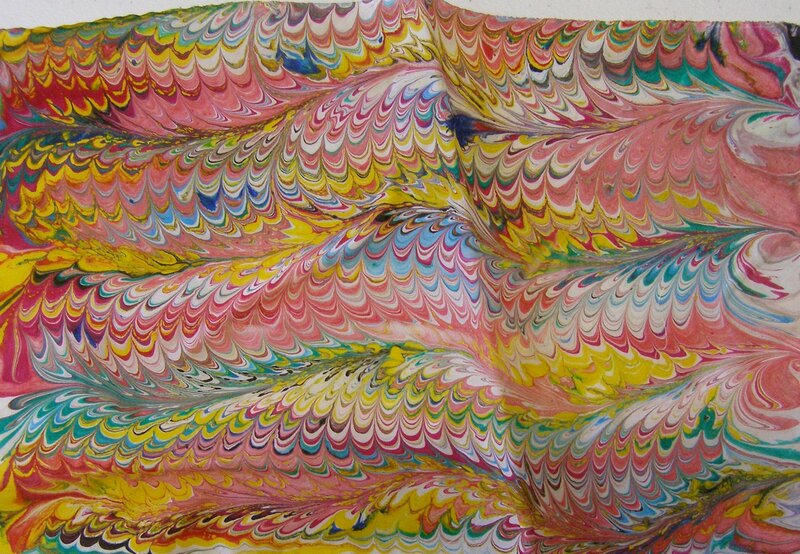 Equipping myself for “proper” marbling rather than the basic shaving foam method took some time. I needed Carageenan which is used to create the size that the paint is dropped onto; Alum (aluminium sulphate) for preparing the paper and fabric so that it holds the paint; the right paints, and various tools such as combs, rakes and broomstick brushes. I couldn’t find anywhere in Australia that supplies the tools so some time with lengths of wood, nails, a hot glue gun and pins was required to create rakes and combs. I also made some broomstick brushes by purchasing a new broom with plastic bristles, cutting these off and making them into bundles. The size mix is prepared the day before, as is treating the paper/fabric with the alum mix so it has time to dry. For my first samples I tried using acrylic paints. 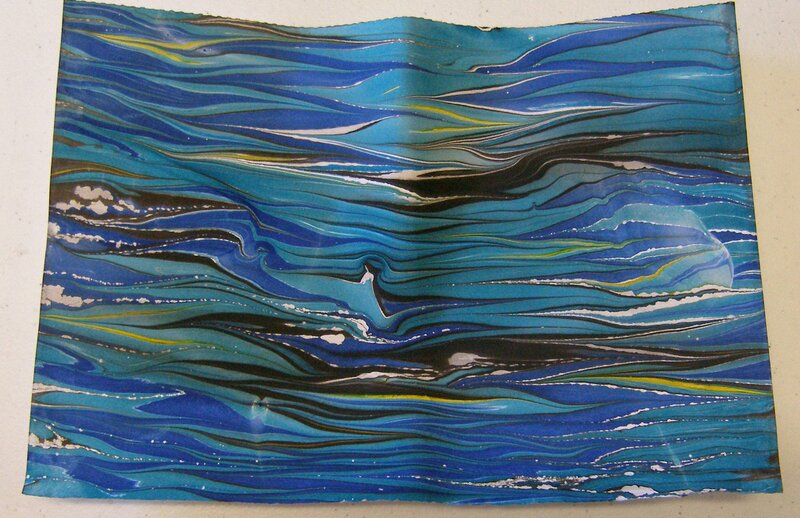 In Galen Berry’s booklet he explains that there is a vast difference between the different acrylics available and not all work for marbling. Whether they work or not is also irrespective of price, as some good quality paints do not work well but other cheaper brands do. I soon discovered that my home made brushes were too short and didn’t work well. I also found that the paints I used (Chromacryl) worked well for some colours but very badly for the rest. In fact the only successful colour was red so I ended up with a very red based print as seen in the photo below. 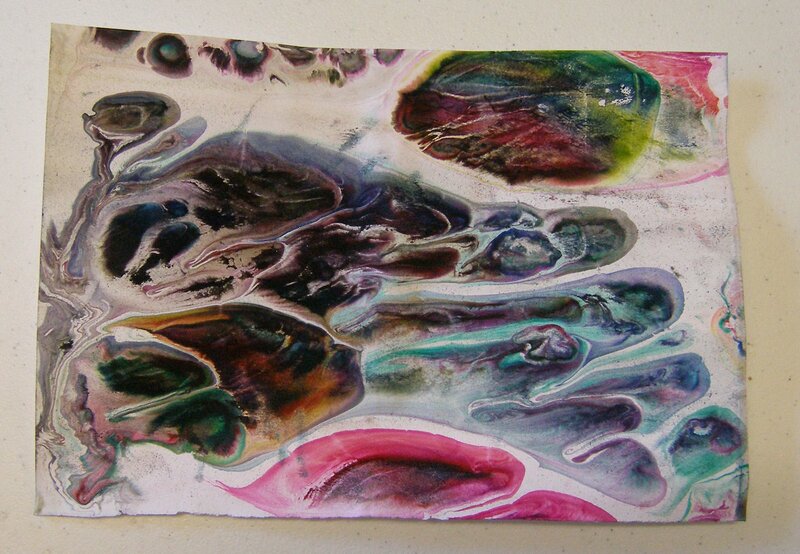 I did a number of experiments with the acrylic and none were successful. A rethink was in order. I decided to try a product I haven’t used before which is Liquitex Acrylic Inks. They come in a bottle form with a dropper so are ideal for dropping onto the size, removing the need to come up with alternatives to the broomstraw brushes. I also got some OxGall which is a wetting agent and spent some time just dropping the inks into size to test how they spread. All the colours apart from black needed gall added to them to stop them from sinking and help them spread. What I hadn’t realised was that my size had deteriorated and was too runny. I reread the booklet to discover that it keeps for up to 10 days in the fridge but mine had not been refrigerated so my first experiments with the new inks were in the “satisfactory-but-not-wonderful” category. The photo below shows a sample on cotton fabric, the colours are quite pale but there is a greater range than using the acrylics. Such vibrant colours and amazing patterns! This is so like the beetle wing designs that I was using in my final project 10 – perhaps I can create more work like this and build on that theme even more? And then on fabric, this time some silk that I had soaked in the alum mixture. Mixed results with the yellow ink in these, with it being quite splotchy in the second print. 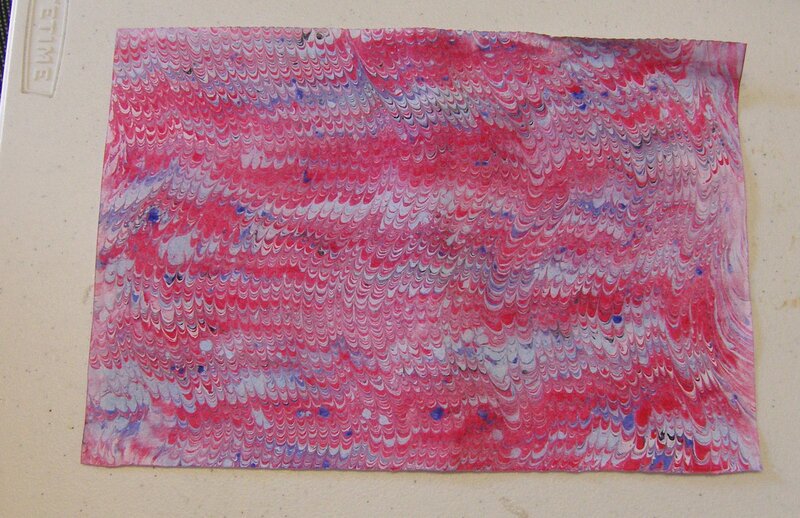 On draining the size from the pan I again made a print with the inks on the base, on another piece of silk fabric. 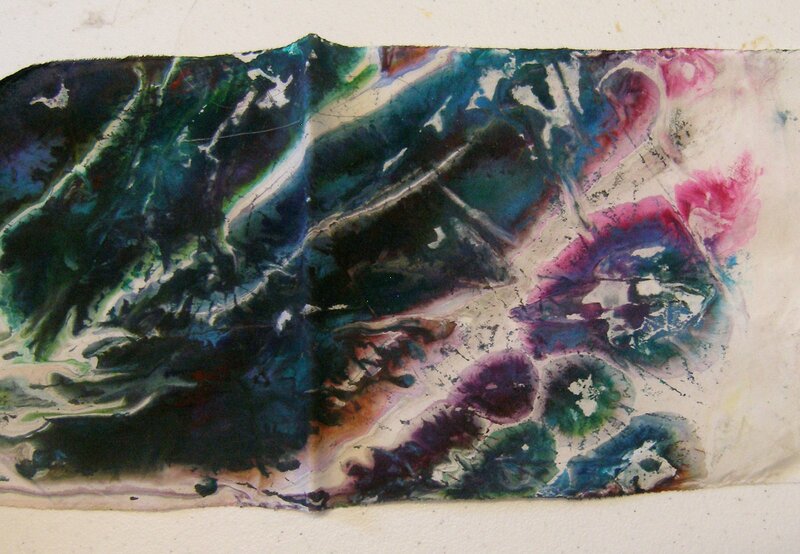 Some more very exciting colours and marks, created at random from the ink remnants in the tray. I still have some work to do on my technique. The size is supposed to be reuseable for a number of prints but mine was getting too dirty after just two prints so I need to do some research and check if I am making it incorrectly. Then I want to try to produce larger pieces as those above are all A4 size or smaller and I will need larger pieces if I want to use them in textile art and particularly if I want to experiment along the lines of Marit Fujiwara’s work.